Jeremy – Filing Status, other? Bike to Work? Emily – City Bike Friendly App, Bike To Work, other? 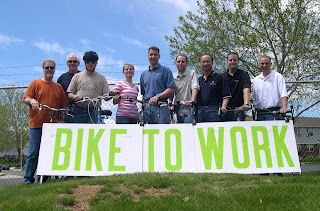 Bob – Bike to Work, BCTV, other? Denise – Mail, bank account, other? Barbara – Minutes, database, other? -- Divide into two team and set strategic plan for each event. NOTICE: ALL NEW MEETINGS WILL BE HELD AT 9:00 AM until 10:30 and are OPEN TO ALL MEMBERS. THERE WILL NO LONGER BE SEPARATE BOARD ONLY MEETINGS. Bike To Work Month Update! "I ride barely 5 miles through West Lawn and Wyomissing starting at 6:00 a.m. There isn't much traffic to contend with only the still morning air and sound of my tires. Awakening and getting into your car and driving to work never sets your day up like a bike ride does. I feel more energized throughout the day and always get more accomplished at work in part because of the high I get from kicking the pedals and getting my metabolism going at a faster pace than the sedentary car ride does. As a long time bicycle commuter Dennis is supportive of bicycle advocacy and ensuring trails are maintained. Throughout his commute he has noticed some areas of trails that could be enhanced to ensure motorized vehicles do not enter the trails and is willing to help put his ideas into reality. I started biking to work in March of this year and it has been fun and thrilling to be able to share this experience with my co-workers and even ride along with them in the morning or after work. I am thankful I live in an area where I can access the Schuylkill River Trail to commute to work. I hope as WalkBikeBerks continues we will be able to help make other sections of Berks County a bicycle friendly environment so others have the opportunity to share in the benefits we bicycle commuters enjoy! Thom Inglin, Dennis Stuffet, Roy White, Christian DeWald, Jeff Wisniewski, Jeremy Slonaker, Jerry Chin, Steve Chmielewski, Steve Thompson - A special thank you to our very own Board member Bob Hospidor for making the sign! Congresswoman Doris Matsui introduced complete streets legislation, the "Safe and Complete Streets Act of 2008", HR5951 in May, and it isn't too early to start drumming up support for this bill. Contact your representative today! Call their office, set up a meeting, or fax in a letter of support (doc). this meeting promises to be exciting! will receive the prize on June 28. Emily Weidner of Temple is leading an effort to have the League of American Bicyclists officially recognize Reading's efforts to promote bicycling. No city in Pennsylvania has the designation, which has gone to 72 communities nationwide. Reading, PA - The city wants to add at least one asset to its growing labyrinth of bike trails and its professional bike race in June. Recognition. It’s applying for designation as a Bicycle Friendly Community. The League of American Bicyclists has given that designation to 72 communities nationwide, but none in Pennsylvania. Philadelphia is likely to be first in the state to get it, but Reading would be happy to be second, said Emily Weidner, who was asked by Reading to lead the effort. Mayor Tom McMahon wants the designation for a number of reasons, among them reducing pollution and congestion, and promoting a healthier lifestyle, said his chief of staff, Cindy Heminitz. Due to the bad weather scheduled for tomorrow, we will promote "Bike to Work Day" on Friday, May 23rd. The forecast says it will be sunny and 75 degrees. If you are participating in "Bike to Work Month" or "Bike to Work Day", please write to walkbikeberks@yahoo.com to share your story. We want to showcase your choice to "Travel Differently" in May. Congratulations to Jeremy Slonaker and all of Baldwin for choosing to celebrate Bike To Work Month together. They set an excellent example for Berks County Businesses. The Reading Eagle was kind enough to post a reminder message in today's paper for us. Members of WalkBikeBerks plan to meet Tuesday with the Berks County Planning Commission to discuss the county’s bicycle and pedestrian plan, which calls for road improvements to accommodate cyclists and walkers. The meeting, set for 7 p.m. in Birdsboro Borough Hall, is open to the public. We asked Bicycling Magazine for their picks for 50-plus cyclists, plus we give you tips for proper bike fit. I was honored to be a guest among so many excellent people on Thursday morning at the Tri-County Chamber's breakfast meeting. 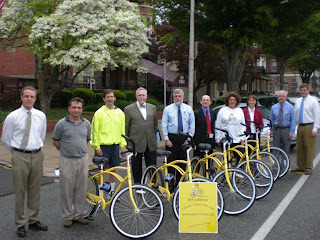 In truth, I was also envious of Pottstown's new program: Bike Sharing! The new yellow Fuji bicycles are beautiful -- and will be a true asset to their community. I plan to visit Pottstown often for biking and shopping. 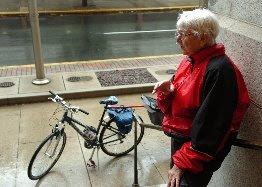 Visit http://www.bikepottstown.org/ to learn about the program. Attend your local government meetings and encourage your community to work towards becoming a Bicycle Friendly Community. Pottstown is launching a bike sharing program! Of course, bike sharing isn't new or restricted to cities. I fondly recall the months I spent in rural Blackwell, PA as a nanny. I could stroll along the country road (or hike one of the various walking paths along the mountain) to a small home where the owner operated a "bike share" of his own. On an honor system, renters could fill out a brief form and leave it and a small fee in a box hanging on the wrap around porch. Then renters choose one of the nice bikes just sitting for the taking and go for the day. Go where? The Rails-to-Trails that meanders along Pine Creek in the PA Grand Canyon. I was on one of those bikes the first time I saw a Bald Eagle fishing to feed her eaglets. The young eagles were in full view as well from that gorgeous, remote trail -- and from the comfort of my 'shared' bicycle. In Washington DC during the National Bike Summit, I invited my friends to visit Blackwell to ride with me again this summer. If you haven't been to the PA Grand Canyon to canoe in Pine Creek or Bike the Rails-to-Trails, make sure you add it to your places to visit this year. Residents in Washington DC have their own opportunity to 'bike share' this summer. Take a look: http://www.healthyreader.com/2008/04/28/dc-smartbike-european-style-bike-share-program/. I'm just as eager to make a weekend visit to the city to bicycle the Capital. 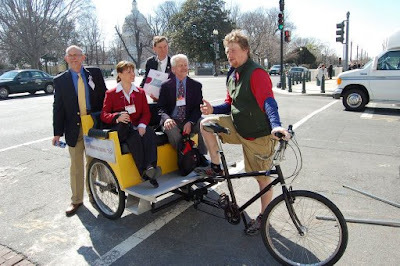 My one-time-around in the pedicab whet my appetite for more biking in our nation's cities. The experience -- relaxed and safe -- riding the pedicab (in the open air at a reasonable pace) was far more enjoyable than the "thrill-ride" of a taxicab just a few nights prior. As a tourist: a bicycle is definitely the way to experience a city. even the most vulnerable citizens -- children, elderly, poor, and disabled. can be implemented through local Subdivision and Land Development. Visibility problems for motorists suggest hazards for other users of the roads. Be cautious if you are traveling in Ruscombmanor Township. The Ruscombmanor Township supervisors have agreed to ask the Pennsylvania Department of Transportation to address a safety problem at Route 73 and Hartz Road.The supervisors explained that PennDOT had recently installed new guide rails on Route 73 that have created visibility problems for motorists attempting to drive into the intersection. The Robeson Environmental Advisory Council has provided an update on the status of the Horseshoe Trail Club.The nonprofit group wants to protect, improve and reroute the trail, which runs along several roads in the township.Council member Todd Stell said the club obtained a $25,000 grant from the Department of Conservation and Natural Resources for a feasibility study and wants the township to match an additional grant of $1,000 that the club has received for strategic planning.The 140-mile trail runs from Valley Forge to Dauphin County, eventually intersecting the Appalachian Trail.The trail linked many furnaces such as Coventry, Hope well, Joanna and Cornwall in operation during the industrial revolution in the 1700s and 1800s.The conservation department has recently put the trail on its most endangered list. To learn more about how you can support a Federal Complete Streets Policy, go to: http://www.completestreets.org/federal.html. Hans van Naerssen, Alex Doty, John Boyle, Jill Minick and all of the others are doing amazing work in for the Greater Philadelphia Area. In fact, Pennsylvania as a whole has benefited from their efforts at the State and Federal Level as well. Please visit their blog to learn as much as you can from their success: http://bcgp.blogspot.com/. Ms. McCann asked WalkBikeBerks to support House Resolution H.R. 5951 -- a brand new Complete Streets Policy that will require states and local MPO's to implement complete streets policies at the state and local levels. Complete Streets are NOT more expensive -- they simply require that design and implementation are done better, to accomodate all users of our transportation system. "First fix the streets, then the people and business will follow." –Dan Burden, Walkable Communities, Inc. In many cases, designing neighborhoods, main streets and town centers so they are walkable and transit-oriented can be a good investment. A 1998 statewide survey of local government elected officials and top staff in California conducted by the LGC revealed that an economic benefit was a clear motivator for these leaders to advocate for pedestrian-oriented design and infrastructure. This fact sheet (PDF, 788 KB) profiles examples of walkable design leading to higher property values, increased private investment, tourism, and, citywide, to a good climate for the businesses of the New Economy. The Economic Benefits of Walkable Communities (PDF, 788 KB). A color hard copy can be requested by calling the Local Government Commission at 916-448-1198, or 1-800-290-8202. This project is funded by the Physical Activity and Health Initiative, California Department of Health Services under a Preventive Health Services Block Grant from the US Centers for Disease Control and Prevention. Work performed as part of a UC San Francisco contract.